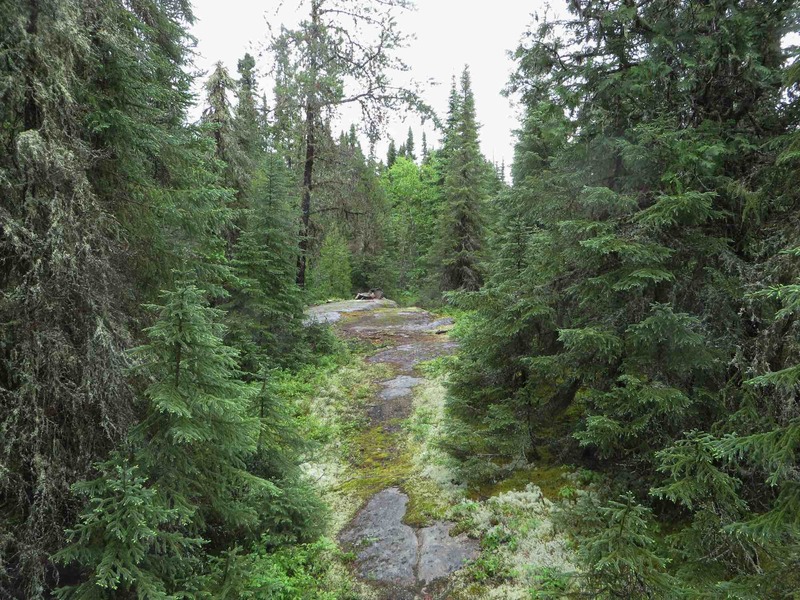 time: start – 1:30 p.m.; finish 6:00 p.m.
campsite: Admiral Falls – off portage right, room for multiple 2-person tents; 4-person a bit more difficult. At noon we were still undecided about whether to move on or not. It was still raining though not as hard as it had the afternoon and evening before – and still more overnight! And then – twenty minutes later – the decision to move! A break in the weather – the rain has stopped! But first, we walked down the side trail towards the falls to get a few photos and a bit of video as a souvenir of our stay at Admiral Falls! 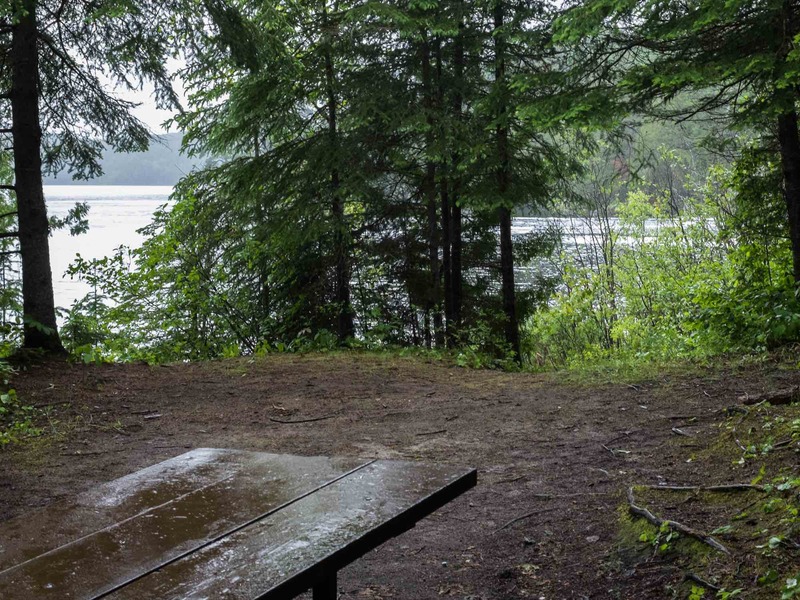 Admiral Falls campsite at 1:20 p.m. – we are moving on! 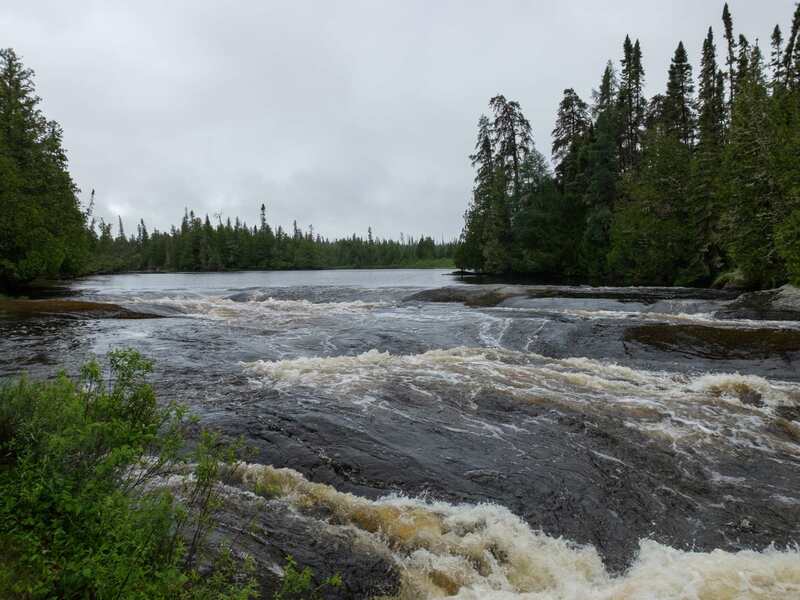 Of the three falls we had seen up to this point, Admiral ranks third in terms of drop, with the two falls we had portaged around on the upper section of Little Missinaibi River – Animiki (“Thunder”) Falls and Mukwa (“Bear”) Falls – both more impressive. Still, to stand by any set of falls and inhale the energized air is never a bad thing! We spent a few minutes scampering around and trying to capture some of the energy! We really should have done the same at the two falls further upriver! And that is it for our pics for the day. It was shortly after 1 p.m. We switched into way-too-serious “git ‘er dun” mode and headed down river. How far? We were not sure. Maybe the campsite at the Trump Lake Portage, maybe a bit further, maybe even all the way to the campsite on Whitefish Bay on Missinaibi Lake. 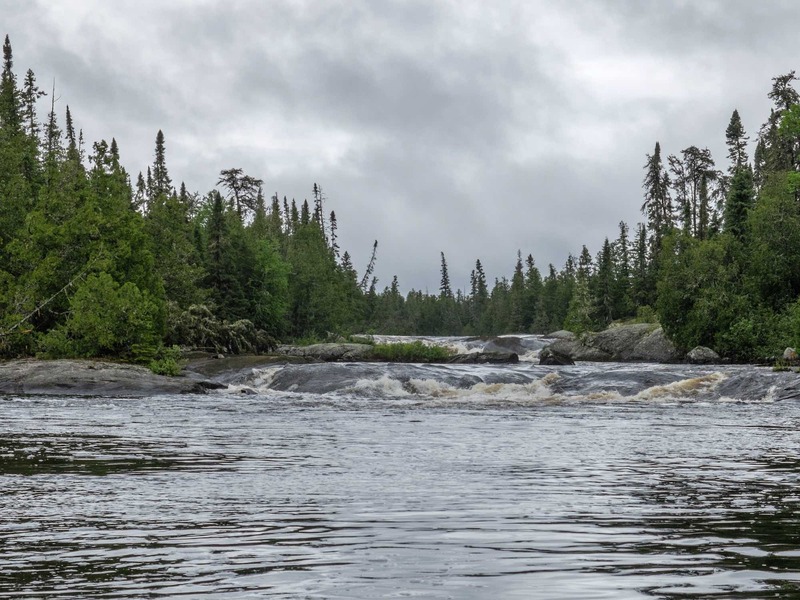 For the first 3 1/2 days on the Little Missinaibi River, our only information was what we could glean from the 1:50,000 topo maps and Google satellite images. 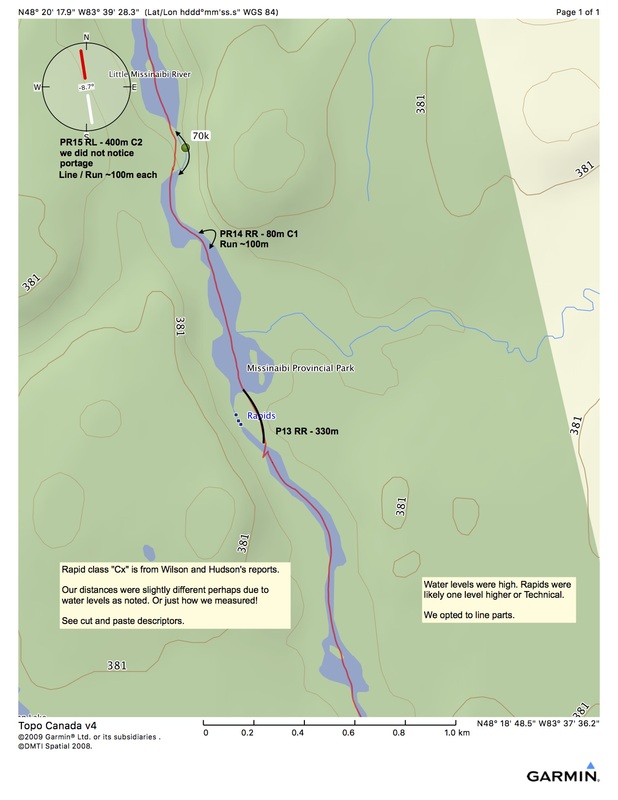 There were no trip reports from other paddlers; there was certainly no official guide! It reminded us of our first trip down the entire length of the Missinaibi River in the early 1980s when info was scarce and sketchy! Now as we headed downriver from Admiral Falls we were paddling again with oodles of information about upcoming rapids and portages. 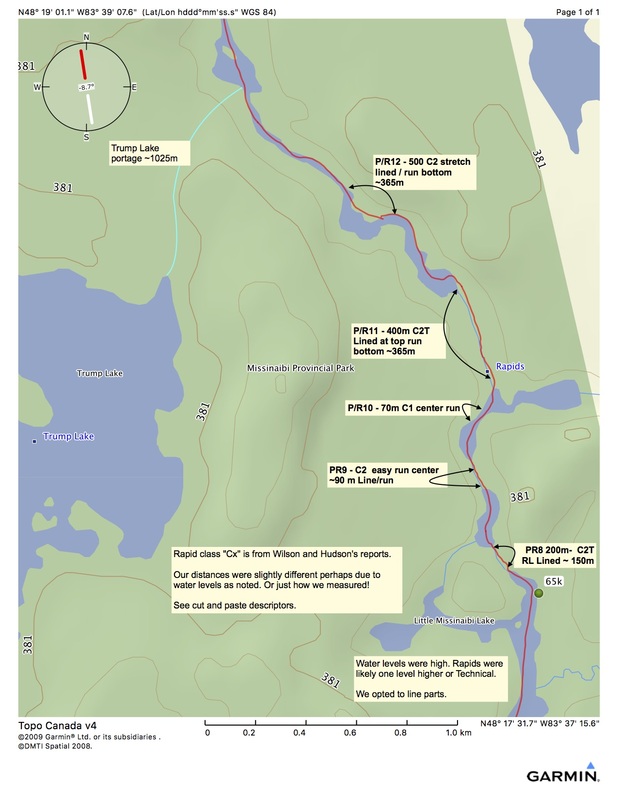 Most useful was a recent trip report from the Canadian Canoe Routes forum posted by Paul Hudson. His crew had done the trip in late July of 2016. While the water level they faced was somewhat lower than what we were looking at in mid-June 2017, we found his comments and observations spot on. 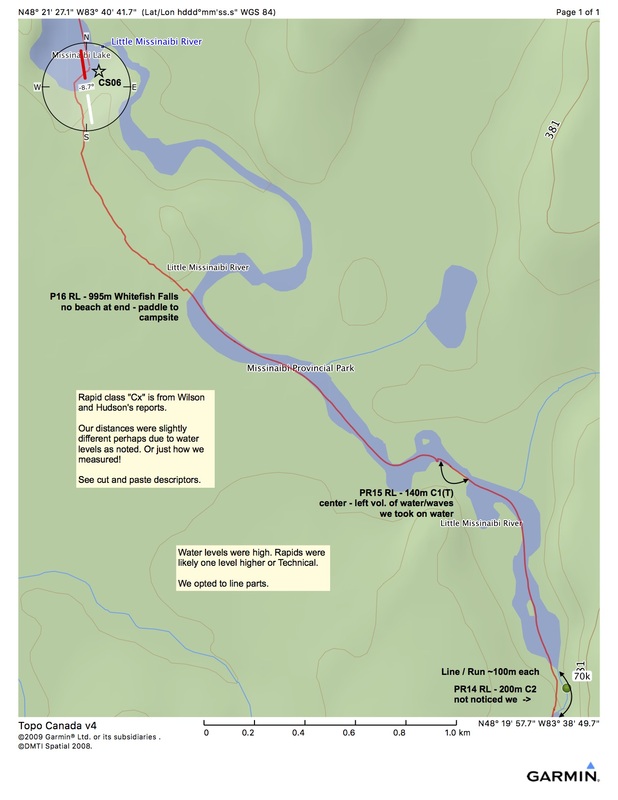 The Hap Wilson guidebook from 1994 also has an annotated map (p.47) of the river from the Little Missinaibi Lake outlet down to Whitefish Falls; a photocopy of the page was in our map case. We left Admiral Falls at 1:30; by 4:45 we were at the take-out spot for the final one-kilometer portage to Whitefish Bay. Amazing! By 6:00 we were at the campsite to the right of the end of the carry. 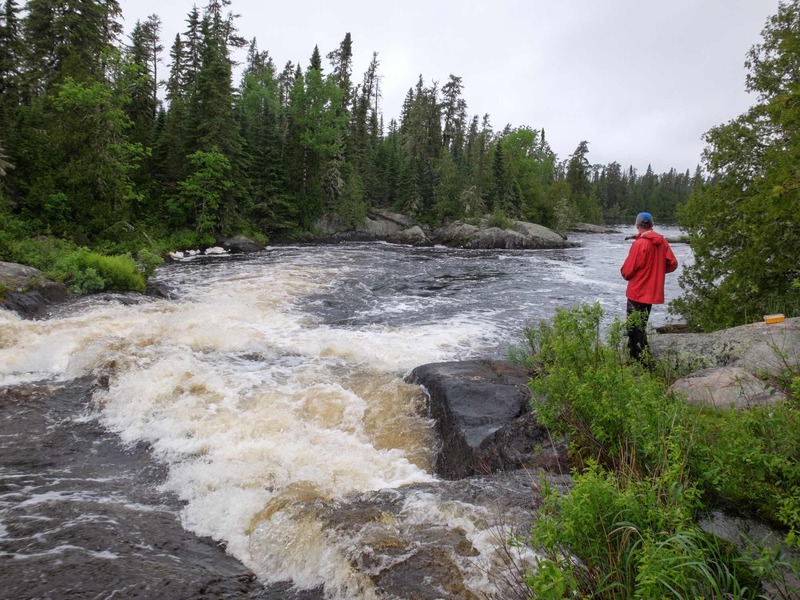 Hudson’s report mentions a walk along the beach to the campsite from the end of the portage trail; there was no beach at all when we got there and we paddled the 80 meters along the shore to the site. There was enough room at the site for both our 4-person Wanderer tent and the bug shelter so both went up. The picnic table served as a handy place to put stuff so that it wouldn’t get sand and dirt on it. To the side of the site is a trail that takes you up to the falls. We would wait until the next morning to check it out. Behind the tenting area, there is also a “thunderbox”, always a convenience! It did not look like it had been used at all yet this year. In the meanwhile, we celebrated having gotten to Whitefish Bay, given that at noon we were still at Admiral Falls trying to decide whether to make a “rain day” of it or not. We toasted our good fortune with a double shot each of Maple Whisky and hoped for some sun the next day so we could dry stuff out. The ongoing challenge of canoe tripping – staying dry while moving forward!